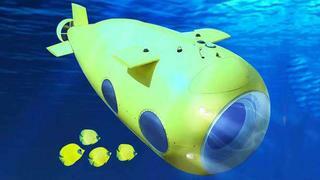 For the ultimate superyacht toy, this Yellow Submarine will allow yacht owners to explore down to depths of 160 metres. The five-passenger Yellow Submarine – or the VAS 525/60, to use her technical name – is being offered for sale exclusively by Y.CO. The sub is 8.4 metres long and has a beam of 2.4 metres and height of 2.6 metres. She can take five passengers, who will be driven by one or two pilots. The maximum speed of the Yellow Submarine is six knots and she has an impressive maximum operating depth of 160 metres, a depth at which she can remain for up to eight hours with five passengers on board. Manufactured by leading mini-submarine expert GSE Trieste, the VAS 525/60 is an all-electric manned submersible, designed to operate in conjunction with a mothership for launch and recovery. She is built to exacting military standards and is the result of extensive testing on commercial vessels. Passengers will have a good view of the silent world via four side windows and through the large bow porthole. Mounted to the exterior are forward and aft facing HD video cameras with zoom and still photo capability. Four forward-facing 3,200 lumens underwater lights are also provided, for powerful illumination while operating at depth or at night. The VAS 525/60 is driven by a slow revolution propeller powered by a reversible DC electric motor. It is also equipped with four cruciform vectorial thrusters – two for horizontal manoeuvring and two for maintaining depth and vertical manoeuvring. It is fitted with two 900 litre ballast tanks, anti-collision sonar, side-scan sonar, eight hours of cruising oxygen, two 2.3 litre CO2 scrubbers and 96 hours of reserve oxygen for a full complement of crew.